Submit your email and we'll deliver your FREE eBook straight to your inbox! Tip: do not use autofill and wait a few seconds after checking the reCaptcha. Take a few moments in the days leading up to Thanksgiving to carve out time for God and feed your soul with His Word. It all starts with thanks, and in just 10 days you can begin to cultivate a habit of gratitude that you will love to practice forever! 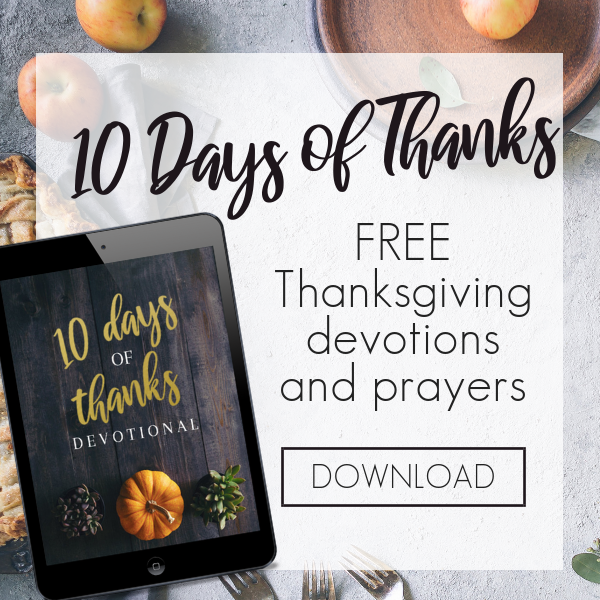 Get the FREE devotional, 10 Days of Thanks, from Devotionals Daily with 10 days of devotions, Scripture readings, and spaces for personal reflection to write out what you are thankful for in the days leading up to Thanksgiving! Plus, we just added a new bonus download: 2 Prayers for the Thanksgiving Table! Prayer is simply a conversation between you and God, and it doesn't have to be anything fancy. But if you're looking for ideas for what to pray as you bless the family meal on Thanksgiving day, you'll find some starters in these free downloads. Don't miss this! 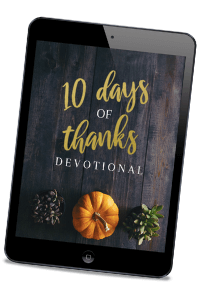 Get the FREE devotional, 10 Days of Thanks!